Fast food without the drive-thru. It can seriously happen…and taste better and cost less. For me, getting dinner on the table every night often involves creative use of leftovers or a simple meal of fresh ingredients. Pulled together in the right way, this can be both healthy and very satisfying. The ingredients for this meal, which is perfect for breakfast or dinner, can be altered to your taste and what you have on hand. If you don’t have the corn tortillas, simply mound it on the plate without. No tomatoes? Stick with red peppers. Don’t care for feta cheese? Swap it for cheddar. If I don’t have the potatoes, I’ll simply use a few more eggs. The following recipe provides the basic outline for a meal you can whip up in a flash and tailor to your liking. Enjoy! Over medium high heat, saute the onion, potatoes, and sausage in a large cast iron skillet coated with the olive oil. Stir occasionally. If necessary, you may drizzle a little extra oil if the potatoes begin to stick as they cook. If using mushrooms, I add them in the beginning. I like the mushrooms a little more well done and the other veggies more on the raw-but-warm side. Meanwhile, in a separate bowl, beat the eggs with the milk, oregano, and salt and pepper to taste. Once the potatoes/sausage mixture begins to brown, add the remaining vegetables and black olives, stirring to combine. Reduce the heat to medium and pour the egg mixture over top of the sausage/veggie mixture. Cook, inverting to incorporate and cook throughout, until eggs are done to your liking. I like the eggs to retain just a bit of moistness. Remove from heat and sprinkle with feta. 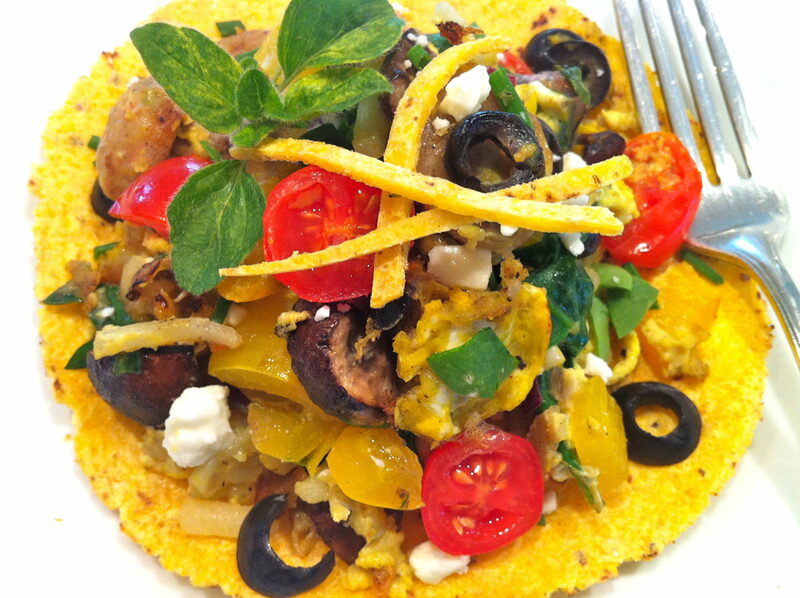 Serve over a toasted corn tortilla, if desired.